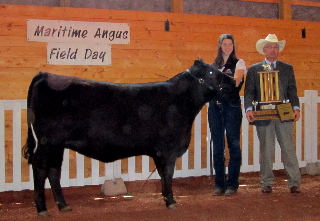 Melanie and Ella Wood exhibited their Champion & Reserve Champion heifers at the 2012 Maritime Junior Angus Show, the largest junior angus show ever in the Maritimes. 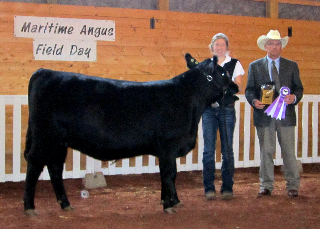 This event was held at the Crapaud Exhibition grounds on June 9th and 10th in conjunction with the Maritime Angus Field Day which was hosted by Bannockburn Valley Farm, the Dixon and Colodey families. Ben MacQuarrie, Hannah and Ellen Dixon also competed at this event. Melanie who is 16 years old and Ella, 15 years old, are the daughters of Carolyn and Reuel Wood of Clyde River. Melanie has been a member of 4-H for 8 years and Ella, 7 years. Way to go Wood sisters !